I think part of what makes someone good at developing new recipes is the ability to notice the properties of one recipe and translate it into a whole different recipe altogether. This is a skill I seem to have developed over the past few years and I think I must have a mental filing cabinet in my head somewhere, where all the things I noticed while working with a particular recipe get tucked away, waiting to be useful again. I will notice the way a particular dough crisps up, or the way a batter thickens or rises (or sometimes fails to rise) and I will think “huh, okay, that’s interesting”. It’s the unexpected qualities of one of my baking experiments that are sometimes the most useful for future experiments. I will then find myself, a few weeks down the road, realizing that I can use this quality to my advantage in another way. And so it goes, I think, that I learn more and more how to coax alternative ingredients like almond flour and erythritol to do what I want them to do. This recipe is really a case in point. I have long despaired of having anything really resembling a good cinnamon roll after being diagnosed with diabetes. 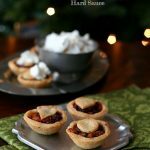 I made one early attempt, with a combination of almond flour and coconut flour, back in the early days of this blog. They were…okay. 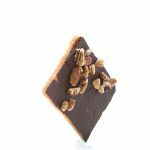 At the time, I thought maybe they were the best I could do using low carb and gluten free ingredients. A little later, I did attempt a sweet roll using carbalose flour, but that does contain gluten and I am moving further and further away from using any gluten products at all. So for the time being, I gave up. I was very pleased with my Cinnamon Roll Scones and thought that they were an excellent replacement in taste, if not exactly in appearance and texture. And then, when I was making another recipe altogether, I recognized something about the dough I was working with that I thought might make a good cinnamon roll. 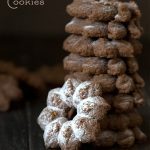 It was the way it both rose and spread during baking that caught my eye, and I thought that if I rolled it out carefully and filled it with melted butter, cinnamon and granulated erythritol, it might just do the trick. Now I will tell you that these are cinnamon rolls of the biscuit dough variety. I have never attempted a yeast dough with almond flour, or with any gluten free flour at all. But traditional wheat flour biscuit dough makes wonderful cinnamon rolls and I knew that if I could just nail an almond flour biscuit dough, I could make a decent low carb cinnamon roll. And so it was, a few weeks back, that a biscuit-y type recipe turned out well enough for me to think it might just translate. The Results: I really loved these. They were tender and moist and perfectly cinnamon-y. Again, they aren’t like yeast dough, but very similar to cinnamon rolls made with biscuit dough. They don’t rise and spread all that much, but I am not sure I really care because flavour and texture were spot on. And my kids loved them too, which is always worth some bonus points in my eyes. To be able to have a cinnamon roll with my coffee in the morning was just heavenly. 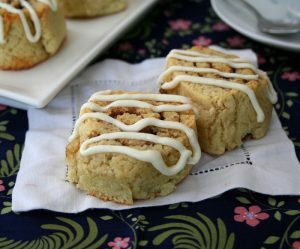 Tender, moist, and perfectly cinnamon-y with a biscuit-like texture, these cinnamon rolls are a sweet keto treat! Preheat oven to 325F and grease an 8-inch round cake pan with butter. In a large bowl, whisk together almond flour, Swerve, whey protein, baking powder, baking soda, salt and xanthan gum. Brush dough with melted butter, then sprinkle with brown sugar substitute and cinnamon, going almost right to edges. Starting with the far, longer edge of your dough, gently lift away from the parchment and roll up tightly towards you. Pinch the seam to seal. Using a sharp knife, carefully cut into 8 equal portions. 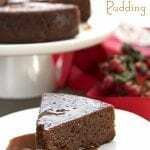 Place in prepared cake pan, just barely touching each other, and bake for 20 to 22 minutes, or until just golden brown. Remove and let cool 10 minutes. For the Frosting, beat all ingredients in a medium bowl and then pipe or spread onto warm rolls. These sound amazing! 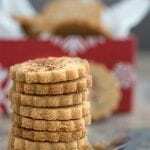 I love that they use almond flour, definitely going to have to try these! I think these sounds like a wonderful alternative. I’m very sensitive to sugar (major rush followed by a major crash) so it would make sense for me to incorporate more recipes like this into my diet. 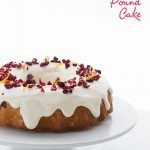 The almond dough alone is delicious enough, let alone when it’s drizzled with cheese icing! Oh my word. I am utterly *delighted* you’ve posted this recipe! I can’t express how delighted I am with your timing. It’s my birthday next week and I was just deliberating on what to do. I was gonna make your cinnamon pecan streusel bread… til I saw this!!!! Thank you, thank you, thank you!!! You are most welcome! They really are yummy. And kid-approved too! Do you have the rest of the nurtrition info. on this? Training for a body building competition and looking for options. Thanks! Carolyn, you are the queen of recreating regular treats into low-carb treats! These look amazing. I’m looking forward to trying these, but I am curious, does the protein powder serve a baking function? Or does it just up the nutritional content? It does, actually. Gluten is a protein and in its absence, a substitute protein helps baked goods rise and set properly. There are other protein powders, like hemp and soy. I’m not a fan of soy, and personally would much rather use whey. I’ve never tried hemp. Can you substitute anything? I don’t have plain protein powder right now, just chocolate. That might be a little strange…but it could be tasty! I can’t do any dairy, including whey. Not a fan of protein powder. Any other subs? Would coconut flour work……? I have read somewhere that dry milk powder helps gluten free baked products rise higher—maybe you could sub that for the whey protein powder? Hmmm. Delicious sounding (and looking). Now, if only I had some heavy cream in the house…. Wow great job on making these low carb… it’s so hard to resist breads but now we can eat these with no guilt thank you! I really need to go out an explore some other flours. I play it safe with white, wheat and oat. I know I am missing out. Awesome, Carolyn – that sounds like a breakthrough recipe! I enjoy your blog very much. I don’t need gluten free etc, but some of my friends do and I pass recipes along when I think someone would be interested. I love nuts any and all nuts both the edible ones and most of the two-legged variety. My problem is with a grandson who is nut sensitive, the edible kind. This of course means a lot more reading of labels. grocery shopping can be a pain, and it seems nut free is a license to steal even more than the gluten free products. Sad. Sorry about your grandson. Nut-free is hard to find and hard to do! It’s so limiting. For my kids, their schools are nut-free so I often have to come up with recipes that have no nuts or nut flours. Oh Carolyn! These look amazing!! Love the use of almond flour! This is exactly the same reason why we keep following your posts and features. Your wonderful insights, your amazing photos and superb recipes…Myfudo here. We wouldn’t normally be attaching links to our comments but we are just thrilled to share with you our new launch. We are moving to a new domain http://www.yumgoggle.com, (previously myfudo.com) this has been a project we have been working on for almost a year now. We just launched our new gallery submission site, and we are just thrilled. Unique and interesting bloggers like you will make the Yumgoggle gallery more fun and exciting. We’d love you to join the latest virtual shindig that is all about food photography, food in general, recipes, and culinary trends. We’d be proud to have your work as part of our growing collection to continue to have a larger reach and further inspire all fellow food lovers out there! Please sign up and check us out (it’s free) http://www.yumgoggle.com/gallery . We look forward to seeing your wonderful pictures, as always. By the way, we are hosting a Kitchen Aid Mixer Giveaway to celebrate our new Yumgoggle site launch, we hope you could participate. =) Keep connected! I haven’t made this particular dough without the xanthan. I have on occasion made things without…depending on the baked good, some hold together, some get really crumbly. Since you are rolling this one, I would be afraid it wouldn’t hold together well without. The dough is fragile enough as it is. I know a bag of xanthan seems really expensive, but since you only use about 1 tsp at most, it lasts a loooooooong time. I keep it in a jar in my freezer and the one bag I bought 2 years ago is still going strong. I still have about 1/4 of it left! I made these today. My husband said there were great and “feel free to make these again!”. But they were VERY sticky. They didn’t resemble buns like your pics. So sticky that next time I’m going to dump the batter in a pan and put the “filling” on top. It will turn out more like a snack cake but I think it will taste the same. Hmmm. My dough was sticky, certainly, but they didn’t bake up all that sticky. What kind of almond flour did you use? If you find your dough too sticky next time, try adding a few more tablespoons of almond flour. I think different brands can sometimes lend to different results. But once baked, they really shouldn’t be all that sticky. Carolyn…. I haven’t had a cinnamon roll for quite some time, and these beauties immediately caught my eye. My mom is diabetic, and we try to make things healthier for her. I saw almond flour in the store the other day and actually had it in my hand, but didn’t get it. Now I’m kicking myself! I admire your ability to create recipes!! I can follow and tweek, but not very often create. Well done! 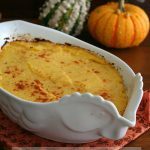 I’m always so impressed at your ability to adapt classic recipes into low carb versions. It looks as though you’ve done it again with these cinnamon rolls! I love cooking with almond flour. These look wonderful!! These look amazing…can’t wait to try them!! I love hearing about your process for recipe discovery. You’re proof positive that necessity is the mother of invention. You’re able to put ingredients together in ways I could never dream, because I don’t have to. You’re amazing. These look delicious. These look amazingly perfect. I have tried with yeast even though gluten free dough does not rise like regular dough but it does give a bread like texture and flavor. I haven’t had a cinnamon roll in a while now, finding myself too lazy to get up way to early to make sure they are ready just in time for breakfast with the rest of the family. Love your quick version, the rolls look perfect! Just made 1/2 recipe – very good, really enjoy them. Do you think they would freeze well? They would probably freeze just fine without the frosting. I am not so sure about with! Well, my 1/2 batch is gone!! My husband said I could makes these every day! So probably freezing won’t be necessary, but I think I will make two batches and freeze one, would be nice to know there is such goodness in the freezer. These were AMAZING! My whole family loved them:) Thanks so much for doing what you do…I especially loved the texture! Hello there, I baked these and they came out looking and feeling nice but they tasted and smelled awful sadly. I had to use milk protein (i.e. whey and casein) instead of pure whey, and sweet’n’low brown substitute – do you think that would have made the difference? They tasted too much of butter, hardly at all of cinnamon and had a real hit of chemical aftertaste. I haven’t ever heard of milk protein so I don’t know what that would do to it, but the sweet and low would absolutely give you a chemical aftertaste. Several people have made these and had the same good results I did, so I do think it has to be your substitutions causing the problem. I live in Northern Ireland so I had to order the sweet’n’low – I couldn’t find any other brown sugar sub. Such a pity as they look so good! Thanks for your reply. Can you get any other sweetener instead? Even Splenda might work better than Sweet n low. Erythritol would be good, if you can find any. WheyLow makes a brown sugar substitute that is fantastic. I use it in everything. It’s a bit pricey but I always wait for coupons. I’m waiting on an order from them right now. I was hoping it would be here by Christmas, darn it…. I hadn’t had a cinnamon roll for a year due to my new low carb life style, a decent cinnamon roll And coffee seemed too much to ask for considering my clutzness in the kitchen especially with baking and my lack of time. I saw these on your blog and decided to wake myself up at 5am the next morning to attempt this recipe, I was that excited. THEY ARE SO GOOD. I would almost say life changing. I’m so glad to have discovered your blog (thru Maria.) And now I see you have the next missing link in my old pastry repertoire …white chocolate scones (which I will add blueberries.) Please never stop sharing your culinary prowess. My mum is diabetic so when I’m buying something for the family to eat, I don’t like to leave her out. She’s more of a savory person anyway but cinnamon is a big hit all round, so I knew cinnamon rolls like these would be perfect. I noticed as well, like someone above, that mine were quite sticky as well which I wasn’t really expecting, so I might butter the pan next time if only to save on the washing up effort. Great recipe, did the trick. I made your cinnamon rolls this weekend and I must say they are fantastic! I used to love making cinnamon rolls back in my wheat/sugar eating days and have missed being able to make such a tasty treat. But these were wonderful, thanks for making and sharing such a great recipe. I think the next time I make them I will put the dough in the fridge to firm up a bit before a roll it out. I did struggle a bit with cutting the rolls but they taste really great even if they look a little smooshed, lol. Hi, I was just wondering if I could make these with erythritol instead of the brown sugar substitute? Sure! That would work just fine. My (far more talented than I) 14 year old daughter who loves to cook made these for me after I showed her the recipe. Yum!!! My husband and I are so happy to be able to have cinnamon rolls again! Now I’ll be asking her to make them every weekend :). Thanks for the great recipe. I really want to try these but I dont have any unflavored protein powder. Do you think they would still come out ok if I omit that ingredient? I made these this morning!!! They were FANTASTIC!! Oh my goodness! These look so good. I wish I can make these but I found out a year ago that my son is allergic to peanuts and treenuts. He is also gluten free (so am I). Finding recipes are really hard but this has caught my eye. Is there another gluten-free flour that I can use in place of the almond flour? There would be no direct substitution for any other GF flour, because they have very different properties. But if you can find a gluten free biscuit recipe, you could probably make it and roll it out the way I did here, fill and roll up again. That might work. Okay, I will see if I can experiment with that. Also, on the whey protein powder, there is a brand that I use that has a “cinnamon bun” flavor. Is it okay that I use that instead? It is the only brand that I like and they don’t sell unflavored. It is sweetened with stevia. I made these just now, and they are REALLY good, and not nearly as hard as I thought they would be. I didn’t have the Xanther Gum, so I used Gar Gum, but will get some Xanther next time I’m at a store that has it. I’m out of brown sugar now, so may make these for christmas morning and just use regular WheyLow. I think my boys would love them. Thank you! I made these this morning. They were delicious by itself (no icing) but they spread when it cooked…A LOT. So it took a bit longer to cook. The icing had no taste to me; it tasted like plain old cream cheese. I put some on one roll and I didn’t like it. I must be weird.lol. Very good recipe, Carolyn! Thank you so much! These had a great texture, but mine were very salty. I’m planning to try them again with half the salt and baking soda. Did anyone else have this problem? Yes, Michele, I thought mine were a bit salty too. I hesitated putting the salt in at all after a whole teaspoon of soda AND two of baking powder. But I went ahead – and now think doing what you’ve suggested will be a good idea next time around. Otherwise they were pretty good! I made these again today with half the baking soda and half the salt. They were much better! Try using peanut flour. I use it quite a bit, makes GREAT pancakes. Mixes well with almond flour too. [needs extra moistner, like more eggs, in recipes]. My favorite brand is protein plus…best flavor IMHO. Would this work by using strictly stevia as a sweetener? I hear sweetleaf has no bitter after taste in the original no added flavor extract form and it also comes with flavors like vanilla and toffee which are popular, has anybody tried this? I am interested in using SweetLeaf too instead of Swerve. Swerve has some pretty bad reviews on Amazon, with complaints of a “cooling” (mint-like) aftertaste that lasts for hours and GI distress. Not to mention, Swerve is more expensive. I have used SweetLeaf liquid stevia for years and LOVE it!! As someone who has used just about every natural low carb sweetener on the market, I think you should try things for yourself. I get zero cooling effect from Swerve, although I know some people still do experience it, whereas I got a ton from straight erythritol. Every palate is different and you don’t know what will work for you. But you can use SweetLeaf here instead of Swerve, if you choose. I made these today with xylitol and hemp protein powder and yuuuuuuuuummmmmmmmmmmmmmm!!!!! Thank you! My husband used to make cinnamon rolls often and keeps saying he’s going to make them “on Sunday.” Of course, I try and usually succeed at talking him out of it. 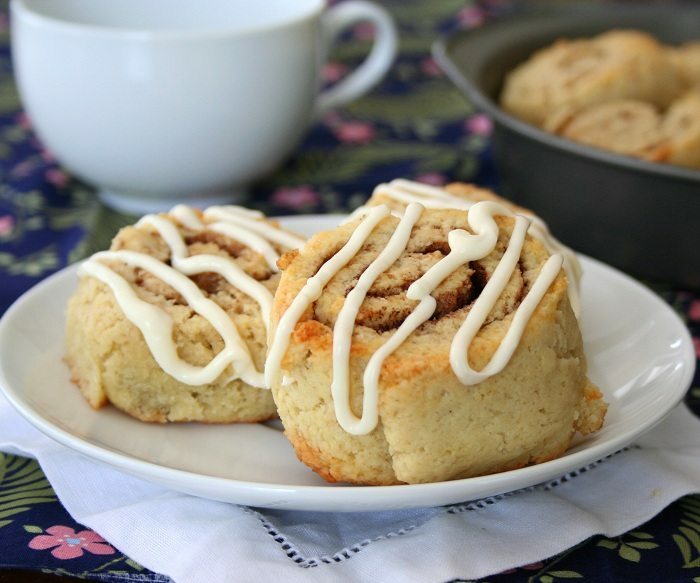 When we were going to have a friend for brunch this morning, I handed this recipe to my husband and said, “here are your cinnamon rolls, you think you can do this?” Oh yeah, they were really really good! My eighteen-year-old son, who does not like low-carb anything, inhaled them! A new Sunday favorite. Wonderful! They aren’t exactly like the real thing but they make an okay substitute! Do you think using vanilla whey protein powder would change the flavor too much? (I love your site and how you’ve done all the work for us!! I constantly recommend your recipes on FB.) Thanks so much! Is your vanilla whey sweetened at all? Go ahead and use but cut back on any sweetener if it is and leave out any vanilla extract. Hi Edna…in addition to the whey protein, make sure you are getting really finely ground almond flour for the rolls. My husband makes amazing (and very high carb!) yeast-dough cinnamon rolls for Easter. This year he made these in addition, especially for me. It was very sweet of him, but the cinnamon rolls…not so sweet. Maybe my expectations were too high, but I found these a bit dry and not sweet enough. 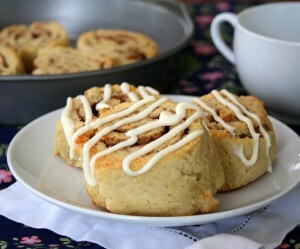 If I make them again, I’ll definitely add more sweetener to the filling, and more cinnamon. The icing was the key for me. It made a huge improvement. At least they kept me from eating “just one” of gooey, sugary ones. would it be OK to omit the unflavored whey protein powder? or sub something for it? Sure, you can do that but add a touch of vanilla extract. I left out the xantham gum, added 2 T of coconut flour….rolled out just lovely. Baking now, I know they will be delish! Thank you! I just made these, I followed the recipe and instructions exactly as written. The dough was very sticky but it rolled out on the parchment just fine and rolled up even easier. They are buttery cinnamon deliciousness! Carolyn, can you recommend a good unflavored whey protein powder? I’m not familiar with that product yet and I want to make sure I get my ingredients as close to yours as possible. I can’t wait to try this recipe because I’m learning to get my diabetes under control, too. Thank you SO MUCH for this recipe! Hey Carolyn! I made these 2 weeks ago and they were great! I couldn’t find a brown sugar substitute in stores so I just used an erythritol/cinnamon mix I have around to go on other breakfasty things. I started to look for the Ideal brown sugar sub online only to discover that it has been discontinued. What would you suggest instead of the Ideal? I love erythritol, it tastes just like sugar to me where as aspertame and sucralose, even stevia based things have an after taste to them for me. Are there any erythritol relatives out these in a brown variety? You could try adding about 1 tsp of molasses to your erythritol (you can use blackstrap molasses) to give it that brown sugar taste and appearance. It won’t add many carbs…6 to the whole recipe. These are very good! Thank you so much! do you think I could make these the night before & cook them in the morning? I want to have them Christmas morning but certainly don’t want to prep them then. Thanks!! Yes, but let them come to room temperature before baking. I am wondering what the xanthum gum is for? What can I replace it with, I have all the other ingredients? It helps hold things together but you can try going without. I routinely use psyllium husk powder in place of xanthan gum, just double the amount called for. I have used it in this recipe and it worked great! Aww I wish I had seen your comment before I went out and bought xantham gum. I have a tub of psyllium husk powder that I bought months ago and I’ve barely used it. Made these and they were delicious! I used Lean Shake from GNC to get the whey protein & Xanthan gum. I put in the amounts requested in receipe. The flavor was Vanilla but added more cinnamon. These were super good!! I used Splenda Brown Sugar and it worked out great. I like these better than Cinnabon because I didn’t get the punch-in-the-gut feeling afterward that I always got from Cinnabon. A+! Just made these. Awesome!! I’m so glad I went ahead and splurged on the finely ground almond flour. They came out perfect and look just like your pictures. I made these, really enjoyed them and the next morning, I put them in a baking dish and poured a mixture of egg, cream, vanilla and sweetener over them. Baked them for about 20 minutes at 350 and had a cross between french toast and bread pudding. I served it with LC syrup and butter. Thank you Carolyn, for the great recipe! i wanted to know how i caan simplify this recipe. i try to minimize carbs but i don’t have a problem with eating gluten. what could i replace the whey protein powder (regular gluten?) and the xanthan gum with? I really have no idea if that would work. this recipe is created for the ingredients I use. Woke up Easter morning wishing we had cinnamon buns. Thanks to a quick search I found these. Missing xanthan gum, I added an extra egg yolk. Not really sure what it does but I guessed help with consistency..
Also being lazy I dropped 1/2 the batter into muffin cups – using the melted butter on clean fingers you can tap it down. I then added the extra melted butter, cinnamon, sugar. Topped with the rest of the batter. And baked. Timing should be slightly less. 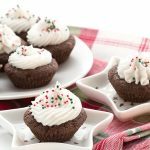 The frosting added a lovely holiday taste and made a welcome breakfast! Thanks! Hi! I would really love to make this recipe. I use liquid sucralose, so what amount should I use for this recipe in the dough, filling and icing? 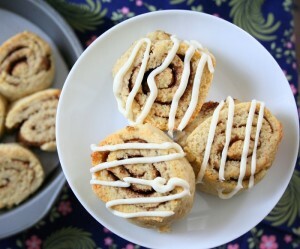 Please, I really want to make these rolls!! Thank you so very much. Use however much liquid sucralose equals my amount of sweetener in sugar. I don’t use it so I don’t know how much that is but there are charts that will tell you. Swerve is as sweet as sugar so I use it cup for cup. it looks like the Ideal brown sugar has been discontinued – is there another product you would recommend or some substitution? Thank you! Where do you get your Ideal Brown? I’m not seeing it anywhere, not even on Amazon. It doesn’t exist anymore. I recommend Sukrin Gold. Carolyn, I bought the sukrin gold. Thank you so much for tha trecommendation. However it is saying on the pacakge 8 grams of carb per 2TBS. Is this correct??? I think it is wrong. Your thoughts. My thoughts are: it’s erythritol carbs which don’t affect most people’s blood sugar, they are excreted directly into the urine. I don’t count those carbs because I test my blood sugar. The flavor of these were great! Just made them tonight. I felt like, though, the dough cracked a little too easily, and that it was a little too textured looking on the outside compared to yours. Is that okay? Otherwise they turned out great, although my outside ones overbaked a little and not sure the inside ones cooked completely properly. Also I think next time I’ll use a tad more sweetener. Plus, I used granulated swerve, not sure if that makes a difference. In the past I found it dissolves and works okay, but maybe the powdered is more concentrated and sweeter? I haven’t tried it yet. What kind of almond flour were you using? That might be part of the difference too. These ended up so good! They didn’t roll very well, I kind of ended up squishing them together to form a roll. Not sure why. Maybe refrigerating the dough would have helped or maybe because I didn’t have protein powder and just added a bit of coconut flour to compensate. Whatever, they worked. I found them much tastier cold but I find most low carb things taste better cold. These must be eaten with icing in my opinion (not sad about that!) Thanks for the treat! I’ve been thinking what to bring with me when I visit my family over Christmas. These are definitely ringing Christmas morning! Carolyn, Has anyone tried that mozzarella-based dough to make cinnamon rolls? I have to admit I am eager to perfect a low carb dough that can be used in a recipe calling for yeast. Hey if yogurt can be considered low carb again because the lactose is metabolized by the yeast and the actual yogurt has much less sugar than what is in the milk used to make the yogurt, then should not the same idea be true about a yeast dough. The amount of sugar used in many yeast based recipes is small. I wonder how much sugar is actually needs by the year to make the dough rise,etc. Just the meanderings of my mind trained in science which also loves baking! Think on this, Carolyn! your fans are many!! When you measure out the almond flour do you pack it, or just spoon it into the measuring cup like you would regular flour? Scoop and level, always. No packing. I have followed you for several years now and am in awe of your ability to bake with the nut flours. I have tried lots of recipes and have had the most success with your recipes. I do have some favorites! What I want to know is if you have any experience with using yeast just for that yeasty flavor in baked goods. 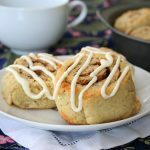 I want to try your cinnamon rolls and thought a bit of yeast might enhance the flavor but I haven’t a clue how to do it without messing it up. Could you comment please on using yeast? Weird how one worked and one didn’t. Sounds like the second batch could have used a bit more almond flour. Don’t be afraid to dust it with almond a few times to see if you can get the dough to work better. Can you tell me if these would fall in an S or a meal on the trim healthy mama plan? What could they possibly be a crossover due to the Allmond flour? S recipe. Most almond flour recipes are because they are low carb and high fat. Thank you for a great recipe. I made these today and they turned out better than I expected. Great flavor and texture. Biscuit like and with a good quality cinnamon they have great flavor. I did double the cinnamon in the filling. I just made these because I didn’t have the blanched almond flour that the cinnamon roll recipe called for in your cookbook (sweet mozzarella dough). I actually had extra dough after cutting a 10×8 rectangle and slicing eight rolls so I rolled out the extra dough again and got four more small rolls which I placed in a greased muffin pan. I liked how those four turned out in the muffin pan! They were a perfect round shape whereas the ones in the cake pan were misshaped triangles. They all tasted good, but I think next time, when I make the cinnamon rolls from the cookbook, I’ll use the muffin pan. Thanks for all your great recipes!! This recipe is a phenomenal hit!!! I made a few substitutions to lower the amount of dairy: Egg white protein powder for the whey, coconut cream for cream and Kite Hill dairy free cream cheese! These are so good! Easy recipe. I substituted granulated erythritol for brown sugar as I had none on hand. Also used vanilla flavoured whey. I think I’ll use a silicon muffin pan next time so they’re not lopsided. I will make these again. Very calorific but worth it! Does the dough freeze well? Hoping I can make a week ahead and freeze. I’ve never tried freezing it, sorry. I think so?